In January when we conducted our annual Blog Reader Survey, one of the topics we were asked to write about was “how to do different tasks with our website software.” Coincidentally, around the same time, I was involved in the formation of a new membership group and had volunteered to create a website for this group. So to fulfill the blog reader’s request and my own obligations – I’m developing a membership website using Wild Apricot and will blog about my experience as I go along. 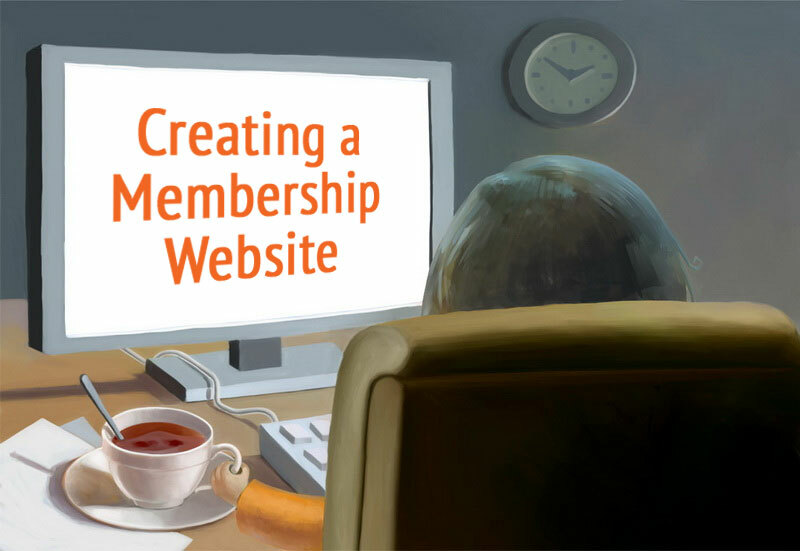 As a blogger for Wild Apricot, I know a lot about the membership management software and its capabilities. However, I am not - as my predecessor, Rebecca Leaman was - a non-profit tech expert. Suffice it to say that when it comes to new software or systems the adage “if I can do it anyone can” really does apply! I’m no tech expert but I’m not “technically challenged” either. I am one of those people who learns how to use software or new media as a tool when it is needed to accomplish a specific task rather than just because it’s a shiny new toy. So I decided that to provide an honest impression of my experiences with Wild Apricot, I would approach this as if I was a typical new user creating a trial account to check out what Wild Apricot had to offer. But unlike many of the folks who sign up for trial accounts, I’m not going to seek any help from the friendly support Apricots. I wanted to try to go it alone as a way of testing both my own capabilities as well as the “user-friendliness” of the Wild Apricot system and its support documentation. I’m committed to going through the steps that a typical new Wild Apricot user or client would – and writing brief posts about my experiences. So - if you are a new Wild Apricot user; you are just considering the software or you are new to this blog – stay tuned for brief posts with updates (like the one below) on my new user journey! 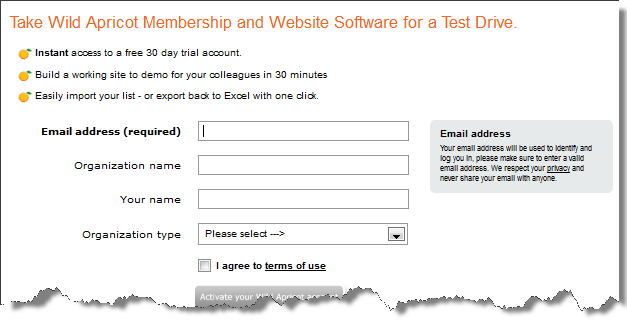 I started this little experiential journey as everyone else does – creating a free trial account in Wild Apricot. I have to confess, I’m not usually the type to create a test account and play around with software. I’m more likely to take an online tour, read reviews and maybe audit a live webinar. But signing up for the free trial was a quick and painless process. I completed the necessary information, submitted it and received a confirmation email right away. The email also offered links to some helpful resources and the all-important technical support contact information. Within minutes I had the URL and password for my trial membership site. Since I would never just jump in and start using or buy software before I did some research. So I took the time to read (OK, re-read) Wild Apricot’s Getting Started Guides as well as listening to a a prerecorded version of a Software Overview webinar before I got down to creating my website. Wild Apricot offers a lot of different types of resource materials – videos, webinars, online documents – so you can choose based on your personal learning style. Since I was particularly nervous about the initial set-up of the website, I watched the “Advanced Setup” video. Next I logged into my new website and started planning out the actual site "look and feel” as well as the main navigation. Now I’ve worked on the development and content of many non-profit and association websites over the years, but I’ve always done this in partnership with web designers and IT experts. This was the first time I’d actually created a website on my own! And as corny as it sounds, it felt great to think that I’d literally created a website! At this point – since I'm the content person not the designer – I didn’t want to worry about adding or sizing visuals, I simply wanted to map out the site. After all, as a writer, I’m more interested in making sure I have the right content and type of pages and formats to meet my membership group’s objectives for the site. As you can see, it’s pretty basic at this stage (just utilitarian) – I haven’t included any of the wonderful travel photos and illustrations that will eventually make this website stand out. I had fun looking through all of the various available “themes” and playing around with the navigation menu items – making them larger, changing the colors. I’d consider this an outline of the contents of the site and the navigation – like a rough draft of a document. Within the first hour, I'd created a website structure that will include a Member’s Forum as well as a public blog. Right now it is just a shell or outline. But the steps I took to create these also helped me figure out what parts of the site should be password-protected for member’s eyes only and which should be available to all viewers. I can do it (You can do it too)! As soon as I began to work in the Wild Apricot system I realized it wasn’t complicated – even for a reluctant techie like me. It was like many of the content management systems I’d worked with creating content for websites or even writing posts for my blog – very user-friendly. Take it slow: If you’re new to creating websites and don’t trust your tech skills, it might make sense to take the rough draft approach as I did. Take it slow and don’t get too caught up in trying to create that compelling visual site on the first try. If this is a new website or you’re taking a new direction and refreshing an existing site, take the time to get comfortable with the interface, while you figure out what sections you’ll need to meet your objectives. In my next post, I’ll take you through my experience in making my new website visually appealing and then on to focus on membership management.